Sharjah Ports Authority has taken delivery of a Damen ASD Tug 2411, named Al Luolo’ Aya and built at Damen Shipyards Sharjah. Damen Shipyards facilities are located in the Hamriyah Free Zone. At the same facility, Damen is also constructing a series of ASD Tugs 2411 and 2810, both on specification and on contract. The Sharjah Port and Customs Authority is a long-term customer of Damen and already has eight Damen Stan Tugs and a recently delivered Damen pilot boat in its fleet. The new Damen ASD 2411 is the port’s first ASD tug. Following the ceremony, Sheikh Khaled bin Abdullah bin Sultan Al Qasimi, chairman of the department of seaports and customs at the Hamriyah Free Zone Authority and Sharjah Airport International Free Zone, toured and inspected the Al Luolo’ Aya. On seeing the vessel, he expressed satisfaction at the quality and outfitting of all the A-brand materials on board, a statement from Damen said. 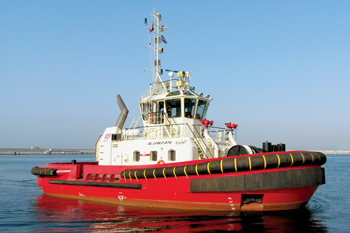 With a 68.5 tonne bollard pull ahead, the Damen ASD Tug 2411 will be deployed at Port Khor Fakkan in the United Arab Emirates. The vessel is fully equipped with FiFi 1 and water spraying notation. Khor Fakkan is one of the leading container transhipment ports. It is strategically located on Sharjah’s Indian Ocean coast, just outside the Straits of Hormuz and close to the main east-west shipping routes. Khor Fakkan’s location makes it an obvious choice for shipping lines that have large transhipment volumes and which also require easy access to the UAE hinterland. Recently, a major expansion of the port has been completed and the new tug will allow the port to handle even larger container vessels. In addition, ASD training is being provided, including ‘on the job’ instruction by an experienced ASD captain.